Scott City, Kan. (westernkansasnews.com)–Thursday’s doubleheader between Scott City and Lakin matched a pair of teams that seemed fairly even. In the end, the teams would split a doubleheader. The Lady Beavers used a five-run second inning to take the first game in five innings 11-1, while the Lady Broncs would rally for a 13-9 win in game two. Scott City would do all their work on offense in the first three innings. They scored three runs in the first, to take a 3-0 lead. In the second inning, a five-run frame was highlighted by a Tori Ford single and an Aspyn Nix single that drove in a run each, which made it 8-0 after two innings. Amber Latta would add an RBI double, Gabby Martinez an RBI single and a Kaitlyn Wolkensdorfer RBI single in the next inning to give the Lady Beavers an 11-0 lead. Lakin scored their lone run in the top of the fourth inning on an error. The Lady Broncs had one final chance to extend the game, as they were caught trying to steal home in the top of the fifth, ending the game at 11-1. Tori Ford had two hits and drove in three runs to Lead Scott City, as they collected eight hits in the game. Amber Latta, Gabby Martinez, Kailtyn Wolkensdorfer, and Aspyn Nix each had one hit and an RBI. Nix left the game at the end of the second inning with an injury, and did not return for the rest of the doubleheader. Jacelynn Buffington went five innings to pick up the win, giving up an unearned run on one hit with four strikeouts, and three walks in 81 pitches. Talyn Beltran had Lakin’s lone hit and lone run of the game. Makennah Hernandez went four innings, giving up 11 runs, nine earned, on eight hits, with five strikeouts and six walks. Lakin and Scott City would go back and forth in this game, but the deep ball for the Lady Broncs would be the difference in the end. After Lakin had an early 1-0 lead, Tori Ford drilled a ball over the center field fence with two outs to tie the game at one. 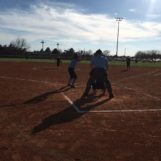 The Lady Beavers would score three runs in the second inning highlighted by an Amber Latta bunt single that scored Judy Wiebe from second on the throw, to make the Scott City advantage at 4-1. Lakin would come back and eventually score the next eight runs of the game. Makennah Hernandez’ solo shot in the third inning pulled them to within 4-2, and the Lady Broncs tied the game in the fourth inning on an error and passed ball. In the fifth Lakin would have four hits and also take advantage of four Scott City errors. Riley Bemis, Vanessa Herandez, and Jaya Esquibel each had a base hit to drive in a run in the fifth inning, which turned into a four-run fifth to give the Lady Broncs a lead they wouldn’t surrender at 8-4. They added a run in the sixth to take the 9-4 lead. When it looked like Lakin would cruise, here came the Lady Beavers. Ella Rumford and Payton Suppes had back to back singles, and Melany Duff scored on an error to pull Scott City to within 9-7. In the top of the seventh, the Lady Broncs put the game away for good, thanks to a three-run blast by Talyn Beltran, followed up by a second Hernandez solo shot to give them the 13-7 lead. Scott City scored two runs in their last at bat, as their rally fell short at 13-9. Talyn Beltran would have three hits and drive in three runs, while Makennah Hernandez had three hits and two runs driven in. They finished with 13 runs on 12 hits, while committing four errors. Scott City finished with nine errors, as they had nine runs on nine hits. Tori Ford and Kaitlyn Wolkensdorfer had two hits apiece in the second game. Scott City is now 3-5 on the year, and will return to GWAC play on Tuesday at Colby. Lakin is 5-3 overall and faces Elkhart on Monday.